South Carolina’s College of Charleston is a great example of a small college that has seen – and absorbed – large amounts of supply this cycle. Heading into the cycle, the university had no privately owned, off-campus student housing supply. But since 2012, the school, which has about 11,000 students, has added more than 1,400 new off-campus beds. Those beds give the school a 13.1% off-campus bed-to-student ratio. 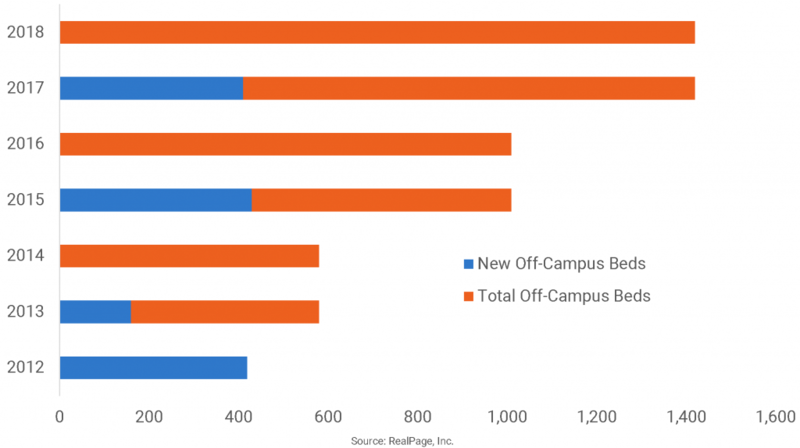 In 2018, off-campus occupancy stood at 92%. Following a supply lull in 2018, the school should see 619 new beds come online this fall.